A MOPED rider was taken to hospital after a high-speed crash during a police chase through Kentish Town on Tuesday. The young rider was thrown off when his bike hit a BMW in the 5pm smash at the junction of Camden Road and York Way. Three police motorbikes were at the scene immediately. 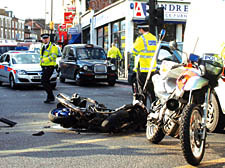 They had pursued the moped to the crash scene from Junction Road, Tufnell Park. The moped was later found to have been reported stolen, police said after the accident. Eye-witness Eddie Kehoe was working in the Electric Transport Shop, at the junction of York Way and Camden Road, when the crash happened 15 yards from his front door. As police tried to restore the flow of rush-hour traffic, an investigation was launched into the cause of the crash. A Met police spokeswoman said yesterday (Wednesday) that police had been alerted by a member of the public, concerned about two mopeds in Junction Road. The moped rider, who is thought to have broken his leg in the crash, was treated at University College Hospital, in Bloomsbury. The driver of the BMW was treated for whiplash injury.